When we first saw Rare's massively multiplayer pirate game at E3 in June we wondered if its co-operative teamplay mechanics would work for us. We've played many a co-op game before, but were not ones for constant communication throughout. Yet that's what we found ourselves doing during a hands-on play of Sea of Thieves at Gamescom. Indeed, you couldn't shut us up. That's because the 2017 title instantly grabs you by the barnacles and you feel compelled to work with friends, new or old - chatting away all the time in order to fulfil your goals. It's like an team bonding day out, expect with more grog and sea shanties. The premise is that you are a pirate thrust into a persistently online world, with a huge open map full of oceans and islands and adventure and riches await. You have your own small ship and can scoot about on your tod, encountering the game's missions solo, but the most fun to be had, we feel, is in helping crew larger player-owned vessels and working with other players for maximum booty. What's more, the better yield your team missions result in, the more likely you can upgrade and expand your own ship too. We found out plenty about the game structure at Gamescom. It will have missions and secrets to discover, and treasure to find. However, much of it will also be about huge sea battles, and this was the focus of our gameplay session. We teamed with four others to man one, huge pirate ship. We took the wheel while our teammates each performed other tasks, such as raise the anchor, the sails and man the cannons. The game is stunningly simple to pick up and play. There's no clunky user interface either, with everything in the game visual. Even the map is an actual, rolled-up scroll that you carry around with you. And firing a gun, or using the steering for the ship is as simple as tapping one button to interact with it and moving around the thumbstick. It gives you the freedom to concentrate on barking commands to your teammates or engaging in some pirate banter. Of course, actually winning a sea battle isn't quite so simple. A battleships turns like a, well, battleship. And with two enemy vessels facing us we eventually sunk. That was the end of the demo but far from the end when playing the final game. 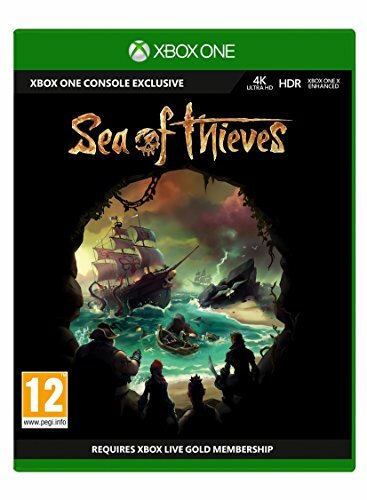 In the game itself, you will be able to swim to the depths of the sea for sunken treasure, discover caves to hide your ship, and many other classic pirate film tropes. Even when you die, the game will continue, with you becoming a ghost pirate and taking charge of a ghost ship. There's much more to come from Rare about Sea of Thieves, and we're yet to even find out which quarter of 2017 the developer is aiming for, but even on this early showing it is looking mightily promising. interaction with others online can often be a disappointing experience, with many seemingly set out to ruin your fun rather than enhance it. But everything we've seen and heard so far about Sea of Thieves suggests it could buck that trend. Certainly, in our gameplay session, which was with a couple of others we knew and a duo we didn't, we very quickly slotted into roles that aided each other. And surprisingly didn't just muck around. We soon started chatting and chuckling away as we manoeuvred our ship around. In many ways it is the totally opposite to No Man's Sky, which is a very lonely experience. Sea of Thieves offers a fun and friendly one instead, encouraging interaction, and given that there is plenty of time for development yet, we're looking forward to see the other elements come into the fray. It will be available for Xbox One and Windows 10 when it releases next year.